I have already posted Aloo Tikki recipe earlier.. Will call this Version 2 ( V.2) .Much more simpler Alu /Potato Cakes recipe and less time consuming. Got this recipe from my Gujrathi aunt who lives in London. She is quite an expert.. at it:) I was making Aloo Tikki chat and planned the next day some Ragda Patties .. When I was having a quick regular conversation with her.. Thats when I got this sooper easy recipe !! These Potato Cakes recipe is soo much straightforward . Just mash the boiled potatoes along with some bread , a little masala here and there and just fry it. Wash and boil the potatoes. Allow it cool a bit . Make sure to peel and mash when still warm. Once cooled , it will be slightly difficult to get a uniform mash. Tip in Salt & Chilli powder to the mashed potatoes .Soak the bread in water and squeeze the water out. Add it to the potato mash. Give them a good blend. Prepare the pan for shallow frying. Make small balls out of the potato mash and give them a gentle press between the 2 palms . Dust them with a bit of cornflour and place it in the pan. Repeat this for the rest of the mash . Shallow fry in batches of 4. Let the heat be in quite a medium flame throughout . Allow the tikki’s to turn light brown on one side and then flip thro the other side. Once it turns light brown , drain them onto the kitchen tissues to remove the excess oil. 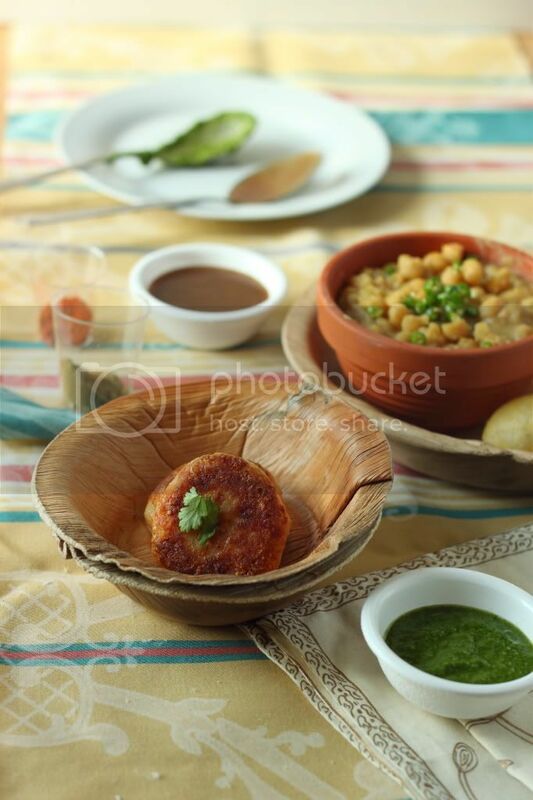 Garama Garam Aloo Tikki is ready to be served with Chutney’s or Sauce. I used them for Aloo tikki chat that I had prepared for a Bombay Nite potluck at a friend’s place. stunning clicks.. and awesome recipe. my all time fav..
thatz a quickie! nice clicks Sandhya! oh what a lovely tikkis… wonderful snaps too dear..
Is this so simple to make? Must try..I want to stop eating this from the way side stall ( which I do almost every day. ).Let me go and see the earlier post too..
Wow,beautiful presentatio dear:)Simple and yummy tikkis. Liked this simple version of Tikki ! Even I go for similar ones as they are less time consuming too. beauuuuuuuuutiful clicks…loved your cute presentation dear. It is years ago i have made them. These ones looks so so good, love the way you have stacked them. thats truly is quick. we often make tikia chat and next time would definitely try this method. Wat a lovley and beautiful tikkis, yummm! I am assuming they make good veg bbq item as well? i mean instead of frying it i cud grill it right? @ Open Book : Very much… grilling makes it healthy too!! At times I love it shallow fried! Lovely clicks, can't be presented better than this. Just love your healthy version of tikkis. well presented easy to make tikkis. I am sure that everyone went for more servings of this tikki in the potluck party Sandhya! Awesome..such a wonderful party dish..
whata beautiful presentation.. really delicious tilkkis..
i love tikkis…these look very decadent. I stumbled upon ur yummilicous blog…n loved ur beautiful clicks. Tis tikki is soo simple n u mk it look awesome..
Also liked de shortbread cookies. Following u will be bk. Aloo tikki looks delicious! Superb click! Nice recipe and the pictures are very pretty and neat! You have made it just the like the restaurant ones..so perfect… Looks yumm Sandhya and the pictures are so inviting. This is real easy and quick.. thanks for dropping by my blog!! Lovely space Sandhya. Nice to be here, following you to keep in touch. Best wishes. Gorgeous Pics! I so want to eat Alu tiki channa right now! Awesome click. Beautiful aloo tiki, looks delicious. can u quickly pack and send me some? Hi Sandhya, Just wondering if you have received my entry for your event, in case if you haven't i'll send it again. you made such delicious tikis with great ingredients, your photos are impressive!